WILLEMSTAD - There will be more layoffs at the local aviation company InselAir. That's what financial director André Delger told trade union leader Wendell Meulen from UGTK / Cadmu. The airline has informed the union leader of the fact that they will be no longer operating the only working MD-80 the airline has. That aircraft has been on the ground for some time because it has to undergo a so-called C-check. According to Meulen, Delger said that the financial situation of the organization is not going so well. It is not yet know how many people will lose their jobs and Delger himself did not want to confirm the report or the exact number. Sources indicate that it is about 30 employees. A planned meeting yesterday morning with the trade union did not take place because the InselAir director only wanted to talk to the leader of the union, not to other board members, Meulen reported. 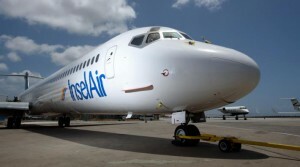 CEO Edward Heerenveen of InselAir has confirmed to the media that the decision has been made to no longer fly with the MD-80. He also understood that director Gilles Filiatreault was busy packing his suitcases.